Monday afternoon I stopped by the Point Reyes Station Library to borrow a copy of Earthquake Bay by the late historian Jack Mason of Inverness. The librarian helped me find the book, but when I went to check it out, he caught me. My library card had expired. I was trying to borrow a book with an out-of-date ID, which made me feel like a motorist who had been caught driving with an expired license. Luckily I was able to get a free new card issued on the spot. As the librarian looked over the title of the history book, he asked, “Does this have anything to do with what happened last night?” I said no, not knowing what he was referring to. But when I got home, I checked The Marin Independent Journal and learned that a 3.5 magnitude quake had occurred near El Cerrito at 5:33 a.m. followed immediately by a 4.0 magnitude quake. The quakes were followed by a 2.0 aftershock at 6:03 a.m. and a 1.2 aftershock at 6:29 a.m. The first two quakes were only eight seconds apart, and apparently many people experienced them as one temblor. I slept through them, but my girlfriend Lynn Axelrod was awakened by the jolting, she later told me. Forty-two of the deaths in the Loma Prieta Earthquake occurred in Oakland when the Cypress Street Viaduct of Interstate 880 collapsed. I’ve gone through some major earthquakes, but all of them were centered far enough away that I wasn’t personally affected. 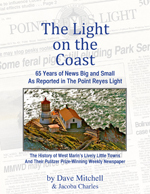 I was in the former newsroom of The Point Reyes Light when the magnitude 6.9 Loma Prieta quake struck on Oct. 17, 1989, killing 63 people in other parts of the Bay Area. Although I felt the quake, it didn’t worry me, but one reporter gave a shout and dashed downstairs and out into the street. As it happened, the only significant damage in West Marin was a break in Highway 1 on a steep slope south of Stinson Beach. That closed the highway between Stinson Beach and Muir Beach for a year and a half while Caltrans rebuilt the roadway. Vehicles stranded when an Interstate 5 overpass collapsed during the Northridge Earthquake. The 1994 Northridge quake centered in Los Angeles killed 57 people. While it registered a respectable magnitude of 6.7, its ground acceleration was one of the highest ever registered in urban North America. However, we in West Marin didn’t feel a thing. I had always heard that many animals can sense an imminent earthquake, and this makes them antsy. As it happened, at 11 a.m. on Jan. 26, 1980, I was home writing The Light on Synanon when I paused to look out the window at a herd of horses grazing in a neighboring field. The next thing I knew the magnitude 5.5 Livermore Earthquake struck, so I kept watching the horses to see how they were reacting. The ground beneath their hooves went up and down, but the horses never looked up from their grazing. That made me suspicious of the old wives’ tale about animals anticipating earthquakes. The following year, I had a chance to further test my suspicion. From mid-1981 to mid-1983, I took a sabbatical from The Point Reyes Light and worked as a reporter for the old San Francisco Examiner. I was barely on the job when on Sept. 4, 1981, a magnitude 5.3 earthquake centered on Santa Barbara Island occurred. The city editor told me to get on the phone and see if I could come up with information to supplement wire service reports. The only facility on the island is a dock, and often the only human is a not-always-available Park Service ranger, so I was left having to call people on the mainland. Checking the phone book, I noticed there is a stable in Santa Barbara County that looks across the Pacific to the Channel Islands, of which Santa Barbara Island is the smallest. I called the stable. “Did your horses do anything unusual before the quake struck?” I asked. “Nothing at all,” said the stable manager. That confirmed my suspicion, but my editors didn’t think my discovery added much to the earthquake story and didn’t use it. The 1906 Earthquake turned the Grandi Mercantile Company building in Point Reyes Station into a pile of rubble. The real earthquake story of West Marin is, of course, the 1906 quake that struck at 5:12 a.m. on April 18, 1906. While the epicenter was south of the Golden Gate, the greatest land movement was in Olema. The levee road across the Olema marsh was offset by 20 feet, which accounts for the present-day jog in the roadway. The quake killed roughly 3,000 people and, along with the resulting fire, devastated much of San Francisco, where most of the deaths occurred. The true number is unknown because the deaths of hundreds of people in Chinatown went unrecorded. Buildings also collapsed in North Bay cities such as Petaluma and especially Santa Rosa, where 64 people died. To the south, San Jose received a tremendous shake that resulted in the deaths of 102 people. In Point Reyes Station, the quake tipped over the 5:15 a.m. passenger train three minutes before it was scheduled to depart for Sausalito. In Inverness, the Martinelli store collapsed and the log-cabin post office crumpled. Houses fell off their foundations, and water mains broke. In Olema, the current of the creek temporarily reversed direction. At Bear Valley Ranch, where the National Seashore headquarters are now, a barn straddling the faultline was torn in two while land around it was offset by more than 15 feet. A fissure opened up, and a cow fell into it, leaving only its tail sticking out when the fissure closed. Although many people considered this story a hoax, the 1906 Earthquake Commission concluded it was true. In Bolinas, the hotel on Wharf Road toppled into the bay, and many homes were destroyed. Tomales’ new Catholic Church collapsed. One of the odder incidents occurred in Marshall. Stanford University president David Starr Jordan in a report on the earthquake noted the Marshall Hotel slid into the bay while remaining upright. None of the boarders were hurt, and the drop was said to have been so gentle that people looking out the windows had the impression Tomales Bay had suddenly risen around them. The 1906 Earthquake, which resulted from movement along the San Andreas Fault, is not likely to ever be forgotten in West Marin. The fault runs down the middle of Tomales Bay, through the Olema Valley, and out to sea at Bolinas Lagoon. No wonder earthquake preparedness is a major concern of the West Marin Disaster Council. Fascinating article on quakes, so near and dear to our lives here in California, Dave. I was interested in the fact you noted the quakes in El Cerrito which we definitely felt in pre-dawn darkness. We felt the first one and woke up and had the same reaction to the second one which was to grab onto one another and wonder if our apartment walls were going to cave in. The other night in Vallejo we had a minor quake, the third one on the fault that runs underneath this city. A quake in 1898 leveled a lot of the buildings on Mare Island Naval Shipyard. BTW, Dave, I was wanting to e-mail this wire story to you about the old Sir Francis Drake landing controversy. Hope it’s okay to include here. PT. REYES NATIONAL SEASHORE, Calif. (AP) — The U.S. government is poised to settle the long-running historical dispute over where British explorer Sir Francis Drake stopped on the West Coast to repair and restock his ship during his 16th century journey around the world. The National Park Service approved designating Drakes Bay north of San Francisco as a historic landmark based on the recommendation of a panel of scientists and archaeologists who concluded it was the likely site of the notorious admiral’s 1579 landfall, the Press Democrat of Santa Rosa reported (http://bit.ly/GEIc2f ). “It is a significant step, It is the final step,” said John Dell’Osso, chief of interpretation and resource education at Point Reyes National Seashore, where Drakes Bay is located. Secretary of the Interior Ken Salazar still must sign off on the designation. Based on maps and journals describing the topography and encounters with Native Americans, some have said it was on the Oregon coast or even as far north as Canada, while others have pointed to another bay slightly north of the spot under consideration. Among the evidence the Park Service panel considered was the research of San Francisco maritime archaeologist Ed Von der Porten, who traced back to Drake some shards of porcelain discovered at Point Reyes National Seashore. “They are looking to see if there are any flaws,” Von der Porten told the Press Democrat. Under the national historic landmark status being sought, Drakes Bay also would be commemorated as the site of the earliest known shipwreck on the West Coast — the 1595 sinking of the San Agustin, a Spanish Manila galleon. The remains have never been found but are believed to lie in the area. While the government may be persuaded that Drake landed at the bay that now bears his name, the debate among scholars will not be settled so easily. Brian Kelleher, author of the 1997 book Drake’s Bay, said he still is convinced that Drake visited Bodega Bay, about 40 miles north of the proposed landmark. Sparsely Sage and Timely is powered by	WordPress 4.9.10 and delivered to you in 0.724 seconds using 56 queries.